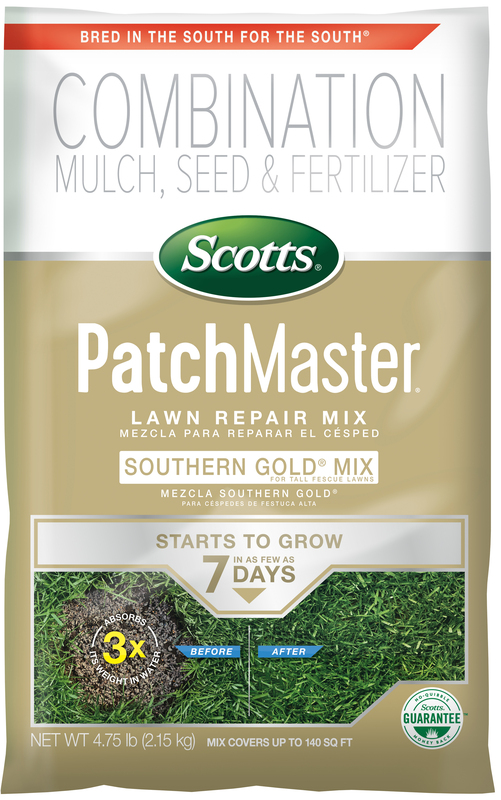 Improved Scotts® PatchMaster® Lawn Repair Mix Southern Gold® Mix for Tall Fescue Lawns is bred in the South for the South® and has everything you need to repair bare spots in your lawn. Includes seed, 100% recycled mulch to keep the seeds moist during establishment, and fertilizer to help feed seedlings for up to 6 weeks for fast growth and thick results. Backed by Scotts® No-Quibble Money Back Guarantee™. 4.75 lb. bag: Bare spot: 70 sq. ft. , Thin area: 140 sq. ft.
10 lb. bag: Bare spot: 145 sq. ft., Thin area: 290 sq. ft.